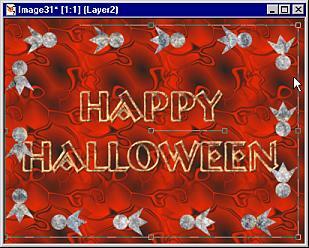 while making a Halloween Greeting card. 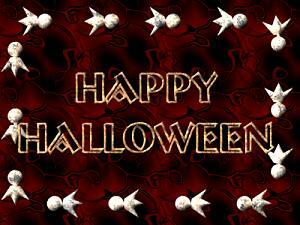 Greetings everyone! 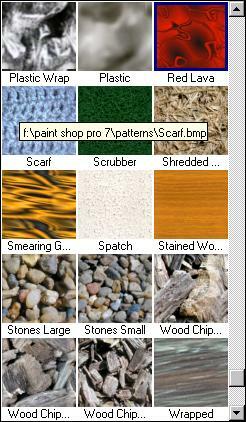 Here we go with Paint Shop Pro Version 7! 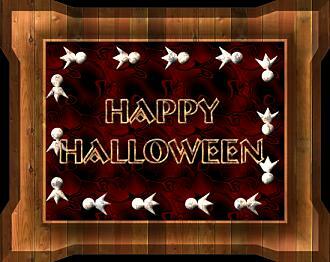 Hopefully this Halloween themed tutorial will cover using some of the most exciting new features. PSP6 users can try the tutorial but will have to the Tool Options Palette to set the pattern fills. Creating Stroked Text won't work and neither will the Styled Line feature. Please consider an upgrade to PSP7 from JASC. Its only about 39 dollars! 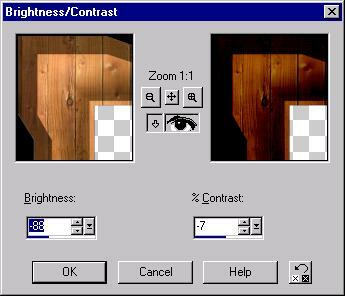 When you do this exercise at home, fire up Paint Shop Pro 7 and notice the biggest difference from Version 6. The color palette has been changed radically! 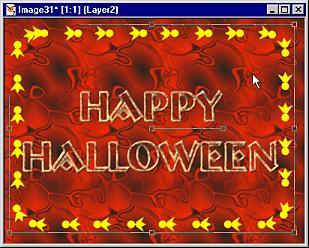 For today's greeting card, create a new file by pressing the White Paper Icon on the Tool Bar at the top of the PSP Window. On the New file dialog box set the following. Width 400 (pixels), Height 300 (pixels), Resolution 72 Pixels per inch. Pick White for the background color by using the drop down box. Image type should be 16 million colors. Click OK.
Let's fill this card with a texture fill. Select the Flood Fill tool on the Tool Palette. On the color Palette, CHECK the Lock box. This locks the color and texture settings for all the tools to the styles you pick for any tool. Its less confusing to LOCK the styles until you are accustomed to the new Color palette choices. Notice the First two boxes under the color picker area, Styles. Click the right facing arrow on the top box, to find the style pop out box. Of the four choices, the first is solid color, the second is gradient, the third is pattern and the last is None. Pick the first choice, with the paint brush icon, solid color. Click in the middle of that swatch to bring up the color dialog box. Set to Bright Yellow, R 255, G 255, and B zero. Click OK to close the color dialog box. Click the right facing arrow next to the second swatch from the top, the Background color one and select the third icon, Pattern, from the flyout box. Next, click the swatch itself. PSP will load all the preset patterns while you wait a second or two, and the Pattern dialog box pops up. Click the downfacing arrow, and pick Red Lava from the presets. Set the Scale to 55 using the slider. Leave the angle at 0. Press OK. When you mouse over the blocks of pattern presets, a file path is shown for each image. PSP7 uses BMP format and extension for patterns, instead of .pat as in version 6, and lets you specify more than one folder for patterns. Note the Edit paths buttons. Now what have we done? Basically this is the same as PSP 6. If you left click in the image, it will fill with the foreground color. 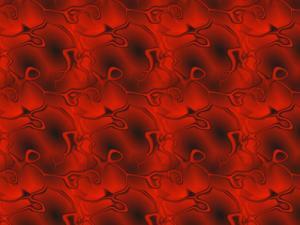 If you right click in the image, it will fill with the Red Lava pattern. PSP7 did saved a step of having to change the pattern on the Tool Options Palette. 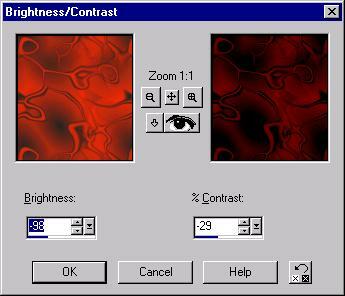 Right Click to fill the blank image with the red lava pattern. It already looks a bit Ghostly, eh? Choose the Text tool. Click in the image opening in the Text Entry dialog box. If you have enough RAM and a fast processor, click the Auto Proof arrow icon next to the Eye icon on the bottom left corner of the box. Move the text box away from the actual image so you can see the live text update on the image. 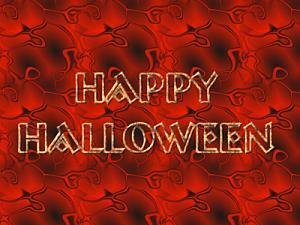 Pick a Heavy font, type in Happy Halloween, on two lines. Set the Font size to big, like 36-48. I typed in 42 in the box. On the Styles area on the left. Click right arrow after the fill swatch and pick the last choice, NONE. Above that, set the Stoke (outline) to Pattern, with the right facing arrow, picking the third choice. Click on the Stroke swatch and pick Cave Rock Blue from the list. Scale it down to 56 or so, Click OK.
Now let's change the width of the stroke (outline). at the bottom of the Tool box and right click on the text. Pick Properties from the flyout box. On the Vector Properties box, Set the Stroke width to 3. Click OK. Pretty cool eh? We will use this again in a bit. First, since Effects can only be applied to Raster layers, and this is a Vector Layer, lets convert it. Open the layers palette by pressing "L" on the keyboard if its not toggled on, and right click Layer 1. Pick Convert to Raster at the bottom of the flyout box. PSP 7 Tip: The Effects now have their own Word on the Menu Bar, and have been reorganized under that from PSP6's layout. Spend some time exploring this new area. With Layer one Selected on the Layers Palette, go to Effects on the Menu Bar, Pick 3D Effects... then Inner Bevel. On the Inner Bevel box, set the following. Bevel, pick the Round edged one. Set the width to 3, Smoothness to 4, Depth to 5, Ambience, Shininess to zero, Color to R 255, G 188, B 129. Set the Angle to 315, Intensity to 67, Elevation to 30. With the Mover tool, move the text to the middle of the image. Let's add a wild border using the new Styled Line feature. from the Tool Palette and choose Rounded Rectangle from the flyout box. Set the Line width to 2. Below that where it says Line Style, click the drop down arrow next to the graphic and pick Arrowhead and Ball from the list. Click and drag a rectangle around the text near the outside edges of the image. It looks like little yellow Ghosts flying around the text. But yellow is not exactly the color we need so let's change that. With the Vector Selection Tool, right click on the styled Ghost line picking properties from the flyout box. Or use Properties button on the Tool Options Palette. Click the right arrow on the Stoke color swatch, pick Pattern from the flyout list. Then click the swatch itself and pick Cave Rock Blue again from the presets list at about 55 percent of the size. Change the Stroke Width to 4 and click OK.
Now bigger grey Ghosts race around as the border. If any of them touch the edges, use the vector selector tool on the handles of the object to resize the box to fit inside the image. Resizing can also help realign the ghosts along the line. Watch them move! Let's give the ghost the same effect as the text. On the layer palette, right click on layer 2 and Convert to Raster. Go to Effects on the Menu Bar and 3D Effects... Inner Bevel. From the Last Used setting, change the Smoothness to 21, Depth to 7 and Width to 10, color to R 255, G 230 and B 207 and Elevation to 40. Move the Ghost layer, layer 2, down on the layer palette under layer 1, the text, by dragging and dropping it there. That will place any errant Ghosts under the text. Turn off the Background layer by clicking its eye glasses icon. Right click Layer 2 and pick Merge, Merge Visible from the flyout box. Now the text and the Ghosts are on the same layer. Turn on the background and select it. Since the text doesn't show up very well, lets darken the background some. On the Menu Bar go to Colors, Adjust Brightness/ Contrast. Set the Brightness to -98 and the Contrast to -29. Click OK. Although the text and Ghosts stand out more, the image still needs something. So, how about adding a wild frame! Merge all the layers by right clicking any layer on the Layer Palette and Merge, Merge All from the flyout box. In the Picture Frame Wizard, Pick Old Wood from the Picture Frame Style. Press next. Select Black for the Background color, press next. Select Black for the Background color. Check the Frame outside of the image radio box and press finish. After a bit of a wait, PSP7 adds the frame on its own layer. A bit bright, let's run that Brightness Contrast filter from the Colors, Adjust... Menu bar item. Set the Brightness to -88 and the Contrast to -7 and press GO.. Almost finished. Make Sure the background layer is selected on the Layer Palette. Add another picture frame using Old Wood, and Black for Background color, but on the third page, check the radio box for Inside the image. It won't look like much, but go to the Layer Palette and with the top Picture Frame selected, change the Merge Mode to Color from the flyout list under right facing arrow on the right panel. Right click any layer and Merge.. Merge all. 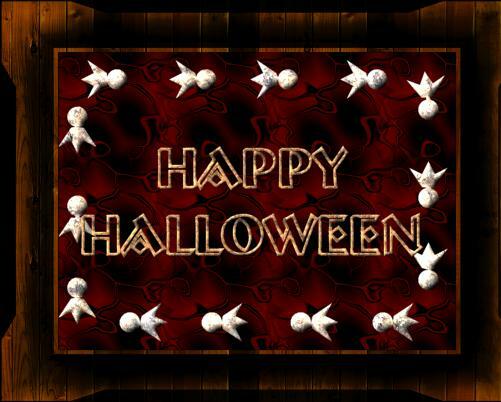 Below is the finished greeting. 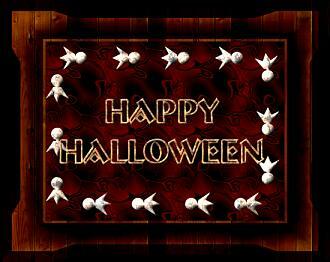 to go on to create some GREAT Halloween cards, with real imagination.